"Obituary - Wilhemina "Minnie" Marie Herbst"
Burial location: Lutheran Cemetery, Farmington, St. Francois County, Missouri. 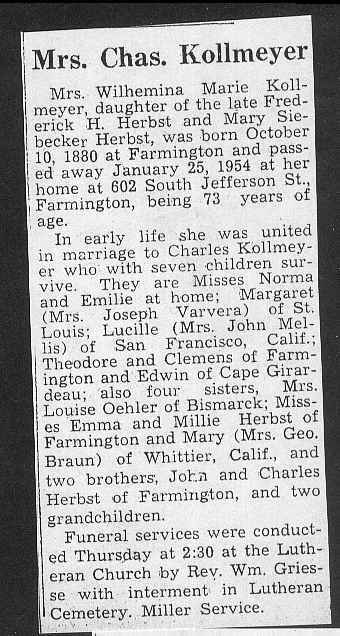 Mrs. Wilhemina Marie Kollmeyer, daughter of the late Frederick H. Herbst and Mary Siebecker Herbst, was born October 10, 1880 at Farmington and passed away January 25, 1954 at her home at 602 South Jefferson St., Farmington, being 73 years of age. In early life she was united in marriage to Charles Kollmeyer who with seven children survive. They are Misses Norma and Emilie at home; Margaret (Mrs. Joseph Varvera) of St. Louis; Lucille (Mrs. John Mellis) of San Francisco, Calif.; Theodore and Clemens of Farmington and Edwin of Cape Girardeau; also four sisters, Mrs. Louise Oehler of Bismarck; Misses Emma and Millie Herbst of Farmington and Mary (Mrs. Geo. Braun) of Whittier, Calif., and two brothers John and Charles Herbst of Farmington, and two grandchildren. Funeral services were conducted Thursday at 2:30 at the Lutheran Church by Rev. Wm. Griesse with interment in Lutheran Cemetery, Miller Service.